Current status: This ebook will be available for pre-order this coming week. Update: Now available. All major ebook platforms. Price: $1.99 USD. Excerpt at the end of this blog post. This is a short TOY MYSTERY gamebook for young readers. You choose what happens. Kei and Will are students at the School of Amusement Arts in New Toy-ko City. They help Professor Felicity Nora investigate unusual cases involving toys and puzzles. A rare set of Chatter Blocks has been stolen. These Blocks talk when you roll them like dice. Help Kei and Will catch the thief and recover the Blocks. But careful, the Perplexity Gang is involved! There are a few different endings. See if you can help the characters solve the case, catch the thief, and learn the secret of the Chatter Blocks. 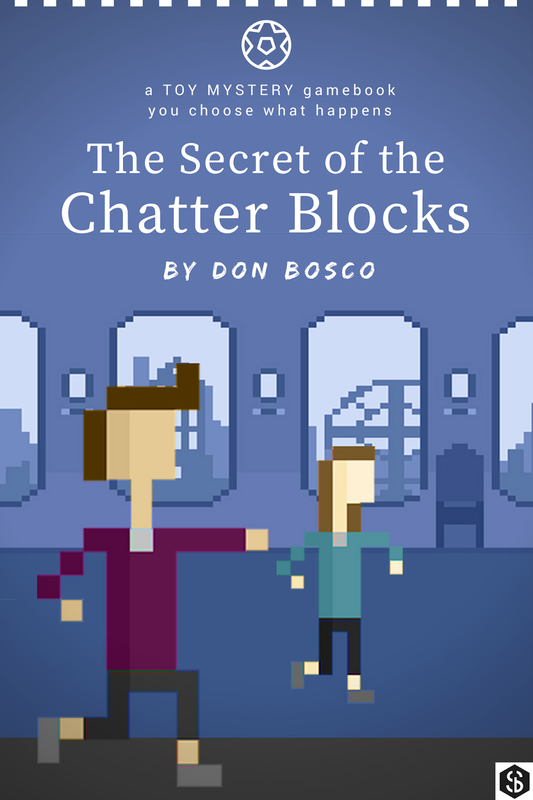 This gamebook has been designed for younger readers, ages 8 to 12. It can be read alone, in a group, or for bedtime reading. It introduces young readers to the interactive fiction genre. What's new: I've written this quirky mystery story for kids. With an interactive twist. It's a chapter book kind of reading experience. Short, thrilling, funny, and easy to read. Nice for reluctant readers. But along the way, you also get to choose how the story develops. Should the characters go forward, or turn back? Should they interview this suspect, or look for clues around the neighbourhood? And when you reach an ending — there are a few possible ones — you're invited to start again and explore other ways to unfold the story. In short, this is what one might call a gamebook. An interactive story. Hypertext fiction. I used to be involved in running local maker events for kids, like the HacKIDemia workshops. We had fun stations to let kids experiment with coding, interactive storytelling, game and toy design, and so on. This Toy Mystery gamebook gives me a chance to bring all those ideas together into one cool creative maker project of my own. And it's something that I'd encourage young readers to create too. The word count is slightly over 5,000 words. If you complete all the possible story threads, that would add up to around 8,000 words. I didn't make this too long, or more difficult, because it's designed for younger readers, and I'd like them to have a sense of ease and fun as they navigate the different story threads and create a mental map of all the possibilities. This format actually makes kids more attentive as they read, because they have to keep making decisions. It also develops their story literacy as they observe how different plots are structured. The tools I used to make this were: notebook and pen, Twine software for prototyping, Scrivener for writing and editing, 8bit Painter mobile app for creating the cover illustration, Canva for designing the cover layout, Preview for slight colour correction, and LibreOffice for creating the final Epub source file. 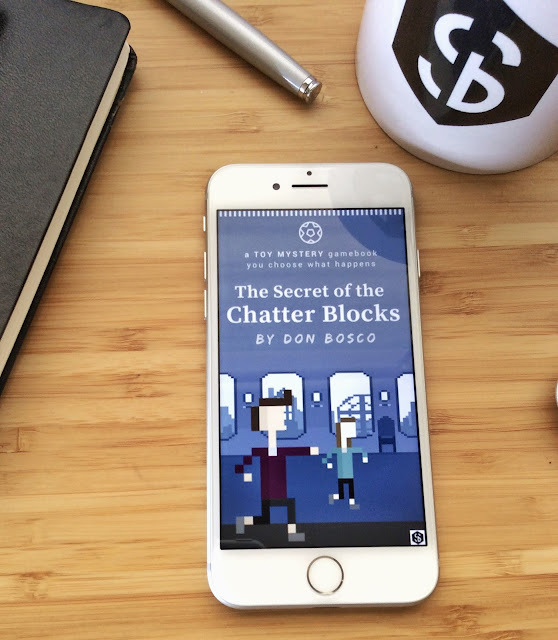 You can make your own story gamebook too. It's a really fun experience, especially if you're collaborating with kids on this. (I worked on Toy Mystery with my two sons.) I'll be posting some articles about my development experience going from raw idea to digital gamebook, and I'll include tips and guides, so come back again in a week or two. Do get in touch if you have suggestions or comments or questions, whether about this Toy Mystery gamebook, or interactive storytelling in general. And here's a short preview PDF below. I should highlight that this gamebook is only available in EPUB format, from the main ebook platforms. This excerpt's PDF layout has been designed just for preview here.